Beautiful lakefront home w/ a shared indoor pool, a marina & more! Enjoy sweeping views of Lake Coeur d'Alene and the Arrow Point Resort Marina when you stay at this lovely three-bedroom condo, an ideal escape for boaters, fishing enthusiasts, golfers, and outdoor adventurers of all kinds. 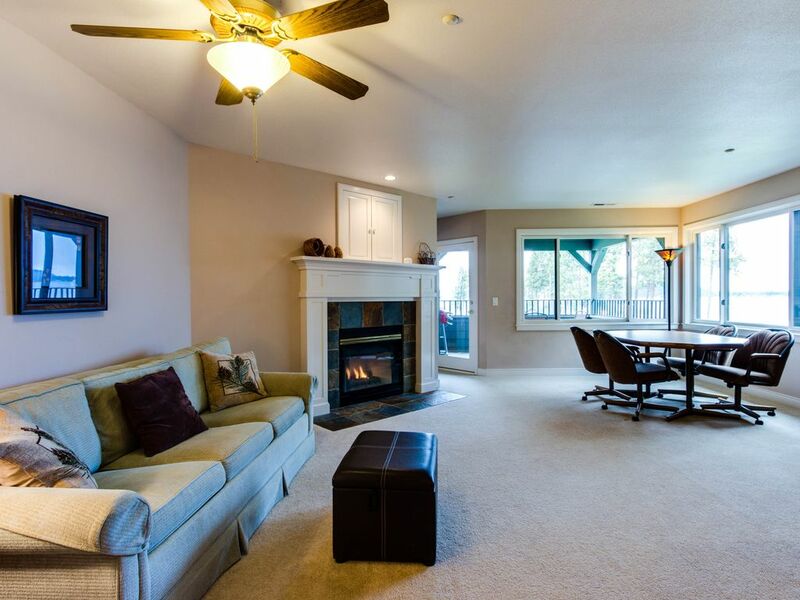 Wonderfully situated along Lake Coeur d'Alene's 135 miles of scenic shoreline, this inviting condo enjoys access to the shared indoor swimming pool, outdoor volleyball court, and boat marina at the Arrow Point Resort. You'll also be just 19 miles north of Harrison, 38 miles from the Silver Mountain Resort, and a quick water shuttle ride from the Coeur d'Alene Resort Golf Course. With central air conditioning and a gas fireplace, the interior living space is comfortable and welcoming in every season. Relax in front of the cable TV after a sunny day on the water, or purchase WiFi access directly from the resort for a small additional fee. Each morning, you'll find plenty of space in the full kitchen to brew fresh coffee, whip up some homemade pancake batter, and stack your plates in the convenient dishwasher. Each evening, head outside to the private stone terrace to enjoy the gas grill, patio seating, and gorgeous views of the lake and marina below. And after spending an afternoon cooling off in the shared indoor pool, playing volleyball with your family at the resort, or taking your boat out in search of fresh Chinook salmon, the patio is an ideal place to relax with a happy hour drink. This three-bedroom, two-bathroom home can sleep as many as eight people. You'll find a king-size bed in the master bedroom, as well as beautiful views of the Arrow Point Marina. The second bedroom has a double bed, the third bedroom has a set of twin beds, and the living room offers a sleeper sofa for extra space. Additional amenities include a private washer and dryer, so you need not worry about overpacking your seasonal outdoor clothes. Whether you're in search of summer or winter sports, Lake Coeur d'Alene is an epicenter of Idaho's pristine natural beauty. Swim in the lake's crystal clear waters, test your golfing skills on the floating green at the Coeur d'Alene Resort Golf Course, or sign up for the legendary Coeur d'Alene Ironman. In the snowy winter months, take a thrilling day trip to experience more than 1,600 acres of skiable terrain at Silver Mountain. Begin planning your escape into the great outdoors today - this wonderful Arrow Point home is waiting for you! Parking Notes: Your assigned garage space is marked A-101. Should you have more than one car, the second car must be parked outside the building in the open parking lot facing the volleyball court/pool house. Boat parking is available from Discovery Marina for $35 per day on "C" Dock. Dock Details: Boat parking is available from Discovery Marina for $35 per day on "C" Dock. Vacasa cannot set this up for you. See the Marina Mgr next to the pool house or call 208-819-6876. Water Access: The resort has both a private and public beach. Vacasa guest are only allowed access to the public beach (by the vollyball court & pool house). You will not have access to the private beach by the Marina or the private restaurant during your stay. You may rent a boat slip at the marina if you like. Wonderful place to stay. I would recommend that the ferry allows guests to pay a fee to cross the lake to Coeur d'Alene. Otherwise if you like a quiet place with a gorgeous view of the lake, this is the place. We thoroughly enjoyed our time there. A relaxing beautiful point on the lake. The deer are plentiful and the facility is a relaxing stay location. Clean and super great location overlooking the lake and right by the elevators. Just be careful to not accidentally hit the fireplace switch if you have little ones as the glass in front of the fire gets crazy hot. Great place, nice and bright. Needs more furniture to make it comfortable.